It started with the kind of problem that hatches romantic comedies: I lost a ring. And not just any ring–one my girl Elena had bought me during a recent BFF-a-thon in Stockholm. Not only was I super bummed, but I felt like I’d let a solid piece of karma escape through my fingers. So I started to hunt for a substitute on Etsy, perusing galleries of resin rings whenever I found myself in front of a TV. And then I came across Colin Butgereit’s store and his angular, mod, 3-D printed objects were *perfect*–I ordered two and considered the obstacle vanquished. About an hour later, I got the sweetest email from the artist. Colin was stoked about the order, and would I be so kind as to leave feedback if I liked the rings? A quick search unearthed that Colin actually works for MakerBot, the company that fashions hip 3-D printers, and his work had been featured on esteemed electronics hobbyist site Adafruit. He also is an artist with a studio here in Brooklyn, just miles from where I sat. So my response anted it up a level: I asked if I could swing by his studio & he could teach me something. It turned out that he was teaching an intro class on MakerBot that weekend at the Madagascar Institute and he generously welcomed me there. I found Colin in the shop this past Saturday morning, sitting at a bay of purring electronics. The MakerBot, a machine like a pedestal from some steampunk gallery, efficiently spun its cocoon of plastic into the coordinates offered by the program. 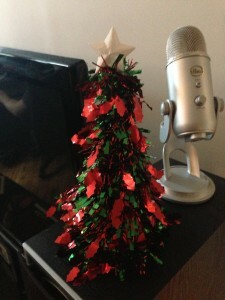 We were making a wee Christmas tree topper, and Colin warmly walked me through the variables involved in preparing a drafted object for production. First we selected an appropriate resolution in order to balance the needs of quality and speed. You can also determine the density of the object by selecting an internal “infill pattern”–like the honeycomb of a beehive. Soon we generated the code to tell the MakerBot what to do, and all of the individual coordinates of the design whizzed by on the screen. This code establishes a “toolpath” for the machine–what it should make first, second and third. Watching this festive token take shape, line by line, totally blew my mind. All of a sudden I found myself looking around the studio, seeing all of the objects around me as a series of engineered layers. Trippy. As we waited for my ornament to print, we started talking about how we think about project-based learning at P2PU. At P2PU, we facilitate an online community in order to prompt this kind of serendipity–connecting people who are passionate and want to learn. As this kind of discovery can happen both online and face-to-face, we’re interested in how those ways can connect. 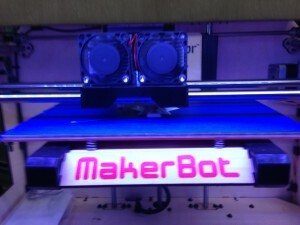 In 2013, we hope to explore more learning experiences between makerspaces and P2PU. I leave you with my very humble prototype.